A couple from our church had a precious baby boy about a month ago, so we signed up on the Care Calendar to bring them a much-needed meal. I found a date we could do it, and I wrote next to Meal: “Thai food”. 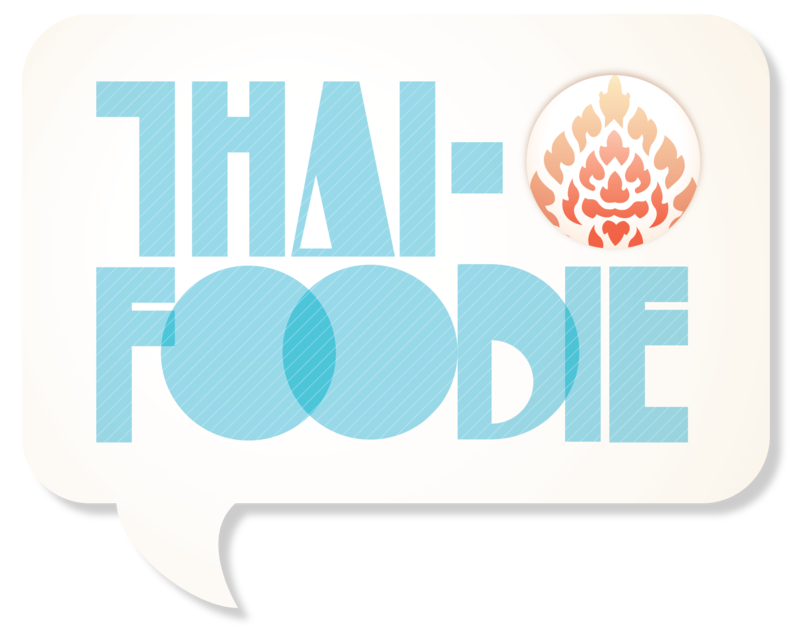 I know they are awesome foodies who would appreciate Thai cuisine, and I know I would want the same in a few months once we embrace sleepless nights and begin walking around like love-struck zombies. Gai Pad Met Ma-Maung, Stir-Fried Chicken with Cashew Nut, was the dish of choice—most Americans like it, plus we had all the ingredients on hand—along with brown rice, stir-fried brussel sprouts with tomatoes and Thai chili paste, and mini mango cheesecake bites. I couldn’t leave Dom out of course. So I made enough for 4 adults and a baby in my tummy, praying as I chopped, mixed and tasted that it would lift their spirits and give them much needed refreshment. As I stirred in the cashews and green onions, I made a plan. 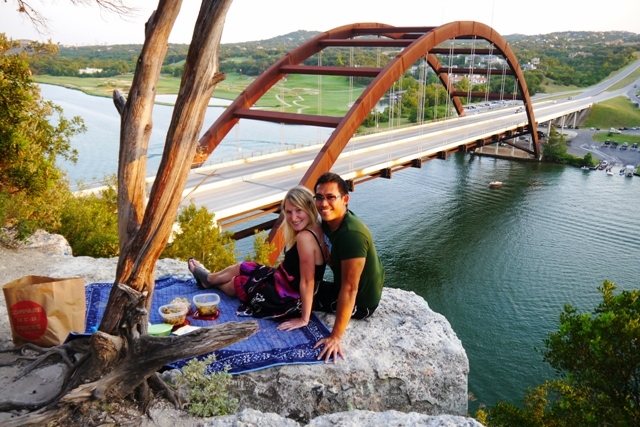 Our friends live in the beautiful west side of Austin in the rolling hill country. I knew on the way back home was a cliff on the hillside that overlooked the Pennybacker Bridge, Lake Austin, and the Austin city skyline. “Okkkk….” he said after I convinced him the Austin heat wouldn’t melt him once the sun was going down. So we took the food to our dear friends, admired their sweet lil one, got some good parenting tips, Dom played with some cool baby toys and then we headed to our romantic dinner date. We parked at the side of the cliff, and it took about five minutes to clamber up the hillside with our paper bag and picnic blanket. I ran over to the ledge and discovered no one else was there. We nestled in, spread out our Thai food goodies, and were in bliss. As we sat and ate, the sun showed off its magic, making the lake sparkle like gold. Boaters were shouting and laughing, water skiers were doing tricks in the falling rays, and the city was glimmering in the distance. 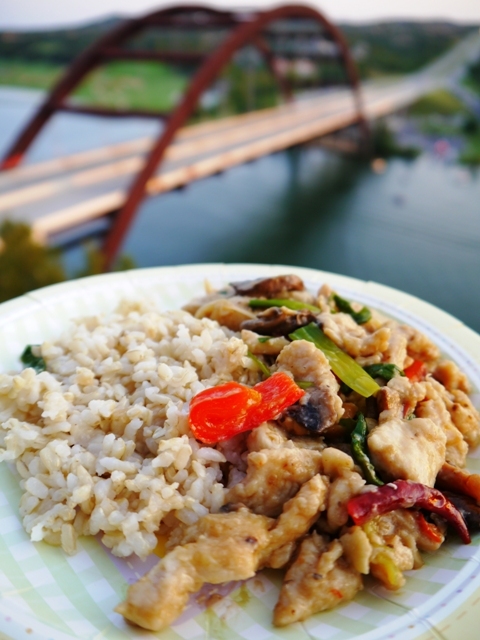 I savored the spicy, nutty, saucy flavors and smiled as the scent of Thai food and the outdoors mingled around me. We talked, snuggled and chatted about how different our lives will look a few months from now with a new little one to add to the mix, and how we can’t wait to meet him so he can join us on our adventures. It was magical Thai food bliss. If you want a taste of that night, try out this Stir-Fried Chicken with Cashew Nut recipe. Let me know what you think or if you have any questions. I’m happy to help! Enjoy your own magical night of cooking and eating this nutty, sweet, spicy Thai dish. Heat cooking oil of your choice in your wok or pan until hot. Add chicken and cook until light brown. Remove chicken and place on plate. Add more oil if needed, throw in the garlic, red pepper, chilies and onion. Stir until fragrant and red pepper is soft. Toss in the chicken again, mushrooms and cashews. Add the chili paste, sauces and sugar to taste. Remember, just add a little at at time of each until you reach your preferred flavor. Once taste is the perfect blend of sweet, savory and spicy, and mushrooms are cooked, add in green onion and turn off heat. If you don't have Thai soy sauce, you can also use fish sauce, or normal soy sauce.